Paul McGinley and Shane Lowry will be at the US PGA in Rochester, New York, next week. Picture Stuart Adams www.golftourimages.comRyder Cup captains Paul McGinley and Tom Watson will be re-united again next week when they tee it up in the US PGA Championship at Oak Hill in New York. The respective European and United States skippers have been officially invited to take part by the PGA of America. It will be McGinley’s first appearance in a major four more than four years. His last appearance in a grand slam event came when he finished tied for 43rd in the 2009 Open Championship at Turnberry. The 46-year old Dubliner’s last US PGA appearance came in 2007 when he tied for 60th at Southern Hills in Tulsa. McGinley has had just two Top-10 finishes in majors but both have come in the final major of the season. In 2001 when shared 10th spot behind David Toms at Atlanta Athletic Club while at Whistling Straits in 2004 he had his career best major finish of joint sixth, finishing two shots outside a playoff that was eventually won by Vijay Singh. Ireland will have six golfers in the field in Rochester with defending champion Rory McIlroy joined by 2008 winner Padraig Harrington, world number eight Graeme McDowell, former Open champion Darren Clarke and Shane Lowry, who is 82nd in the world. McIlroy shows his mettle: "I’ve got a good thing going now and I’m just trying to ride the momentum"
A bulletproof Rory McIlroy became an even bigger favourite for the US PGA when he roared back from a mid-round mini-crisis to shoot a five under 66 at Valhalla. Rory McIlroy leads by two on nine under after another stunning display but while Shane Lowry and Graeme McDOwell made the cut, Pádraig Harrington and Darren Clarke missed out at Valhalla. 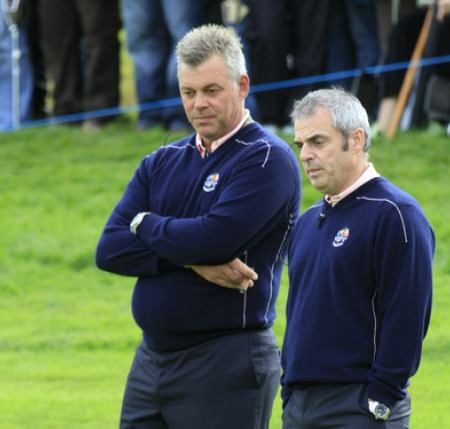 Darren Clarke and Paul McGinley as Ryder Cup assistants in 2010. European Ryder Cup skipper Paul McGinley will have a chance to publicly bury the hatchet with Darren Clarke when he tees it up with former captaincy rival - and opposite number Tom Watson - in the US PGA at Oak Hill next week. Graeme McDowell laments a missed chance at Oak Hill’s 15th. Picture: Eoin Clarke www.golffile.ieThe putting gods did not smile on Padraig Harrington, Shane Lowry or Graeme McDowell over the first two days of the US PGA at Oak Hill. But while Harrington can no longer do anything about it having missed the cut by four shots, McDowell and Lowry are keen to show they’re playing a lot better than their position on the leaderboard suggests. Shane Lowry blasts out of a bunker at the 15th in the final round of the US PGA at Oak Hill. Picture: Eoin Clarke www.golffile.ie Shane Lowry closed his US PGA account with a rollercoaster 71 and declared himself ready to launch his assault on the world’s Top-50.